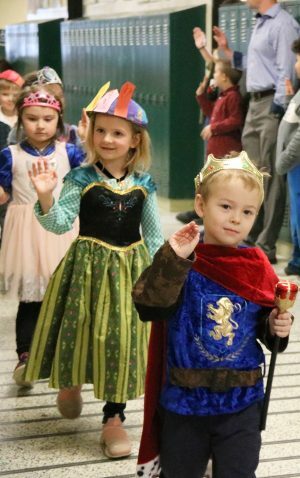 VOLNEY – Volney Elementary kindergarten kings and queens paraded around the school, waving to their subjects as part of a culmination activity for a recent academic unit. Kings and queens gave their best royal wave during the Volney Elementary annual kindergarten parade, a celebration to a recent academic unit. Dressed in their best attire, capes, jewelry and crowns, many of which were handmade from art class, the students paraded throughout each grade-level wing before they met special guests in the cafeteria to enjoy cookies and tea. The royal affair celebrated the students’ knowledge of royal families, advantages and disadvantages of bring royal, royal stories such as “King Midas and the Golden Touch,” and words that end with the letters “ng” and begin with “qu,” among several other highlights.